When Is a Full Liquid Diet Used? 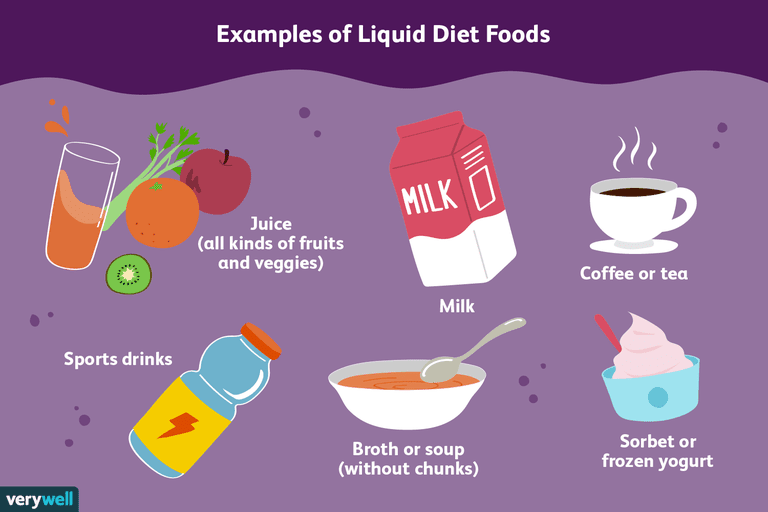 A full liquid diet is made up of liquids only, but unlike a clear liquid diet that essentially only allows clear beverages and broth, a full liquid diet includes thicker juices, milk, and pureed soups. It’s often used before or after some types of surgery or if you have certain digestive conditions that won't allow you to eat solid foods. In most cases, you'll only be on a full liquid diet for a limited amount of time, and the diet is often a stepping stone to the mechanical soft diet. A full liquid diet is often used as a bridge between a clear liquid diet and a regular or mechanical soft diet. It has a greater range of items than a clear liquid diet, yet is still fairly restricted compared to a mechanical soft diet, which allows most types of foods as long as they’ve been pureed, slurried, or pulverized. Juices and broths allowed on the clear liquid diet need to be clear, so the choices are more limited. Clear juices like apple juice are fine on both diets, but on the full liquid diet, you can also consume vegetable juices and citrus juice if fine, as long as the pulp is strained out. In addition to clear broth, creamed soups are allowed as long as they don’t contain any lumps or pieces of meat, vegetables, or noodles. Cooked cereals are also fine as long as they've been strained. Tea and coffee are allowed on both diets, but on a full liquid diet, you can also add milk or cream if you like. You can also drink milk or milk substitutes such as almond, soy, or rice milk if you’re lactose intolerant. Full liquid diets are usually low in calories and nutrients. The goal is usually about 1,500 calories and 45 grams of protein. You may feel like you're getting enough to eat, but a full liquid diet doesn’t contain enough fiber, vitamins, and minerals to be used long-term. If for some reason you are on this diet for a longer period of time your doctor may suggest adding liquid dietary supplements like Ensure to your daily meal plan. If you still need more calories, powdered milk can be added to creamed soups and you can sweeten foods with sugar or liquid sweeteners such as honey or corn syrup. Adding butter or margarine to your hot cereals is also an option. If you need to cut back on calories, artificial sweeteners are also allowed on a full liquid diet. Here's an example of a daily meal plan filled with foods you can eat on a full liquid diet. It has around 2,000 calories, but you can alter the amounts depending on your appetite and calorie needs. If you can't tolerate milk, choose soy or almond milk, and be sure to read the labels of liquid nutritional supplements because some of them are milk-based. If you need to be on a full liquid diet for more than a few days, you may become constipated from the lack of fiber and weight loss is possible with the low-calorie count. Of course, that means that many dieters are tempted to go on a liquid-only weight loss diet, but it's not a good way to lose weight. Full liquid diets should only be done under medical supervision. Most people prescribed a liquid diet will only need to do so for a short period, usually between five days and two weeks. The liquid diet can be low in vitamin B12, minerals, and protein so long-term use (more than two weeks) would require dietary supplements to prevent nutrient deficiencies and muscle loss. One of the challenges of a liquid diet is knowing whether you've to consume eaten enough. As a general rule, you should stop once you feel full. With that said, some people fill up quickly when drinking their nutrition and may not be able to stomach anything more than, say, and tall, 12-ounce glass at one sitting. If you are struggling to drink your nutrition without feeling uncomfortably full, drink what you can in 15- to 20-minute intervals. At the end of the day, you should drink no less than 64 fluid ounces. Some people also worry that certain fruit and vegetable juices may be too high in fiber to be included in a full liquid diet. If you use a high-speed bullet blender, Vita-mix, or juicer to make your own juices at home, it's usually not a problem. You can even strain the juice through a mesh sieve or tea strainer if needed. However, if you need to be on a low-fiber diet while you're on the full liquid diet, it may be good to avoid high fiber juices. Ask your doctor. It's also a good idea to ask your doctor about any additional dietary restrictions you may have. For example, a person on a gastroparesis diet may need to avoid high-fat liquids and a person on a sodium-restricted diet may need to avoid salty fluids. People who have had stomach surgery may also want to avoid orange juice and other acidic fruit and vegetable juices that may cause stomach upset and burning. Just like the clear liquid diet, mechanical soft diet, and a restricted fiber diet, the full liquid diet is only used as a short-term diet in a special situation, such as after surgery, and only with medical supervision, so if you're not enjoying it know that chances are, you won't be on it for long. If you’re not sure if a food you want to eat is acceptable for a full liquid diet, ask your doctor or dietitian before you add it to your diet. Deacon, S.; Moran, N.; Laskey-Gilboy, B. et al. Dietetic intervention for inpatients on fluid‐only diets helps to achieve nutritional requirements. Nutrition & Dietetics. 2018;75(1):17-23. DOI: 10.1111/1747-0080.1235.